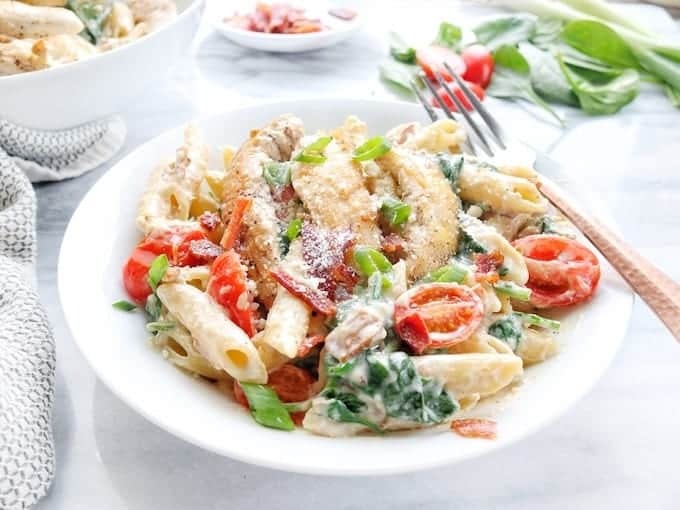 The best creamy Chicken and Bacon Pasta recipe around – made without heavy cream but packed with spinach and tomatoes. This simple creamy chicken pasta is so delicious, your family will request it time and again. 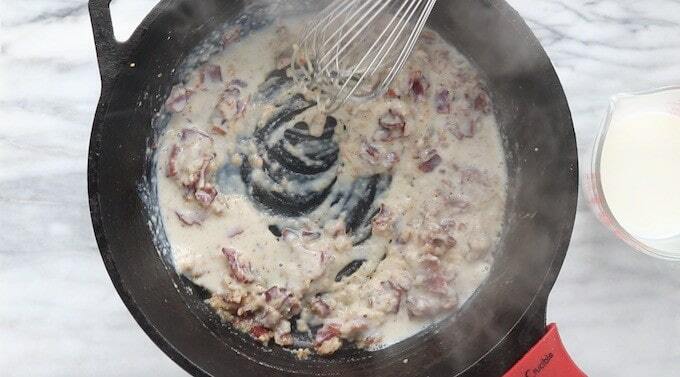 Now open your eyes & keep reading because my creamy chicken and bacon pasta recipe is below. This recipe is simple & delicious! I love to test new recipes with chicken since my kids are constantly requesting chicken. 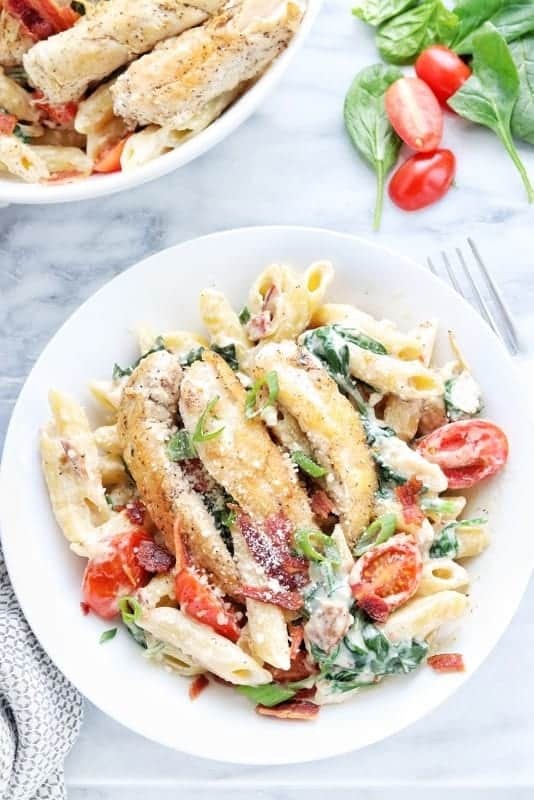 While my Boneless Chicken Thigh and Creamy Chicken Spaghetti Bake recipes are family favorites, this creamy bacon chicken pasta has recently been ranking as #1. Check out this video for step-by-step instructions on how to make a creamy chicken pasta in white sauce! Heat olive oil in a large skillet over medium-high heat. Cook pasta per box instructions. Once the pan is hot, add chicken. Cook about 5 minutes or until chicken is browned and releases from the pan. Season chicken with salt and pepper. Flip and cook another 3-4 minutes until cooked through. Season this side of chicken with salt and pepper. 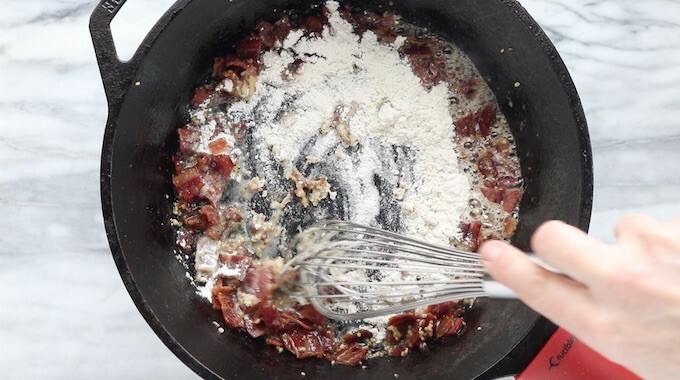 To the same pan, add butter, garlic, and bacon. Whisk until butter is melted. Add flour and whisk into butter mixture. Slowly add milk a little at a time, whisking and bringing the heat back to a simmer between adding more milk. Continue whisking after the milk is added until the mixture thickens. Add cream cheese and whisk to blend into the mixture. 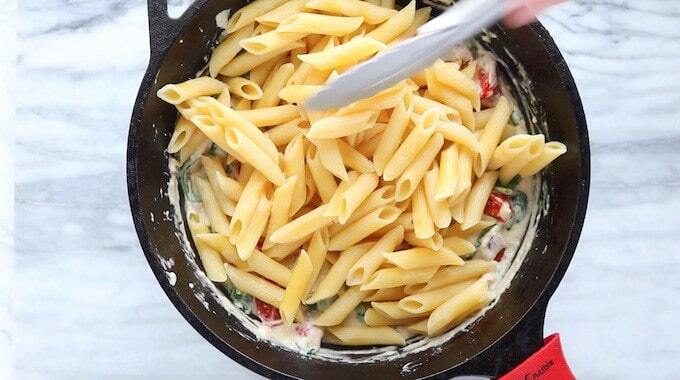 Add pasta to the cream cheese mixture. 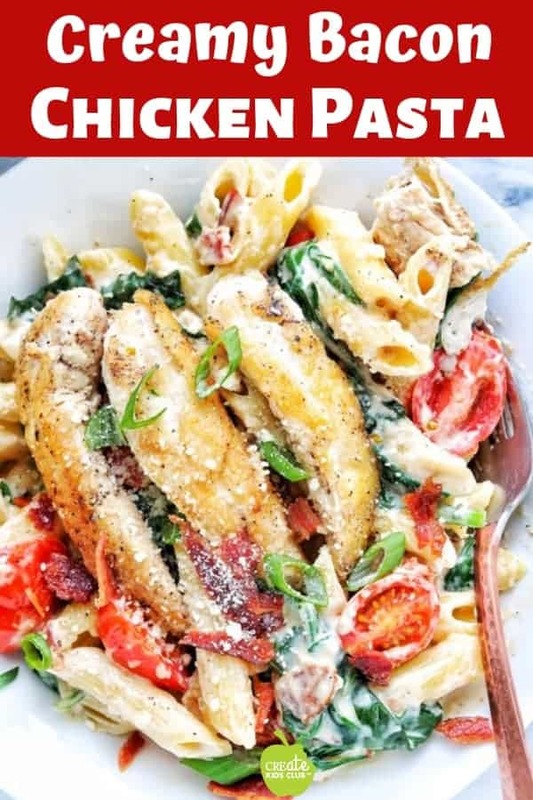 Serve with chicken on top or slice chicken and stir into the creamy bacon pasta. Add parmesan cheese, green onions or bacon if desired. Start by heating the olive oil in a pan and then carefully adding the chicken. Season each side of the chicken before flipping with salt and pepper. KITCHEN TIP: Chicken is fully cooked when the internal temperature reaches 165 degrees Fahrenheit. 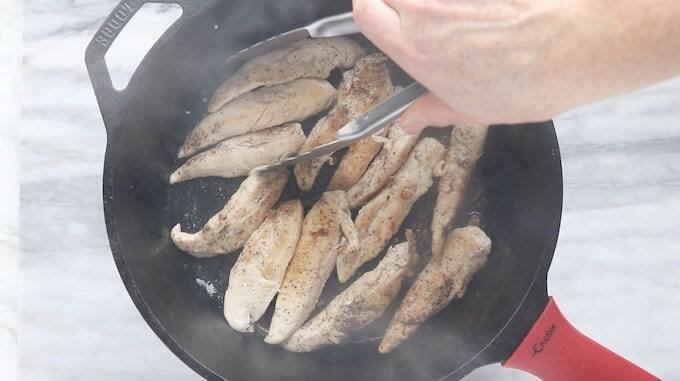 Keep a food thermometer handy to test cooked chicken before serving. Once the chicken is fully cooked, remove from heat and set on a plate to the side. TIME SAVER: For a night you don’t have the time (or energy) to cook chicken for this recipe, buy a rotisserie chicken or canned chicken and skip steps 1-3. 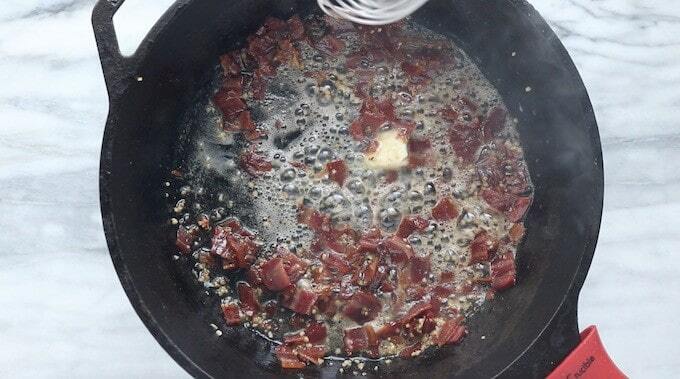 In a pan, add butter, bacon & garlic. Whisk until the butter is melted completely. Add flour and stir into the butter mixture until it is combined. 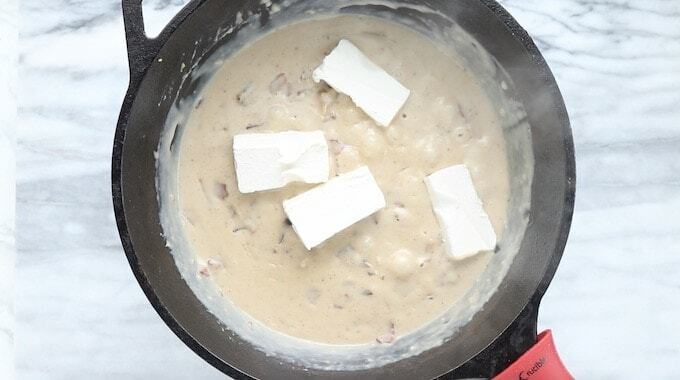 COOKING TIP: Making a roux will help thicken a recipe and create a creamy texture. To make a roux, you mix together equal parts fat with flour. In this recipe, I am mixing butter with flour to thicken my creamy pasta. For future recipes that might need to be thickened, this How To Make Roux step by step instructional post is helpful. Next, whisk the milk into the pan. Add the milk slowly bringing the mixture to a simmer between each addition of milk. I usually add 1/4 cup of milk at a time and keep whisking the milk until the full 1 cup of milk has been added. Kitchen Tip: Make sure to bring the temperature of the sauce back up to a simmer before adding more milk or you’ll have a sauce that won’t thicken. Then, add the cream cheese and whisk until it has melted. DO I HAVE TO USE FRESH SPINACH? Nope! In the past, I have used frozen spinach instead of fresh spinach. I would encourage you to use whichever you have in your kitchen! 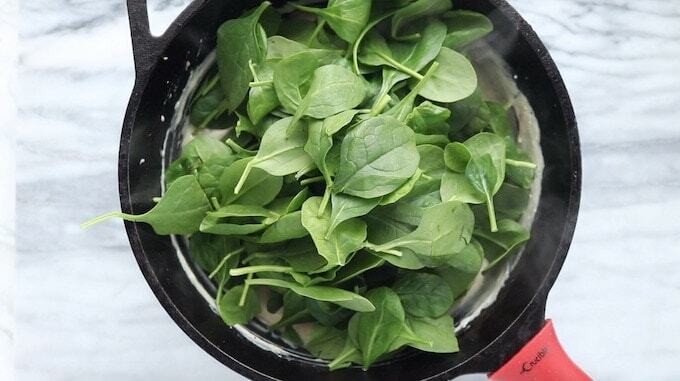 If you do use frozen spinach, I recommend cooking the spinach in the microwave and pressing the excess water out of the spinach before adding to your pasta dish. 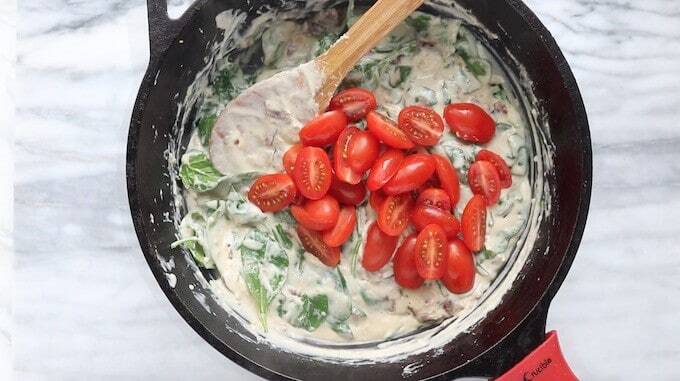 Once the spinach has been mixed into the creamy sauce, add sliced cherry tomatoes. Have you ever wondered if you can use grape tomatoes instead of cherry tomatoes? Well, I am here to tell you that you absolutely can! If you have grape tomatoes in your kitchen then save yourself a trip to the grocery store & add those to your dish. If I can choose, I prefer using cherry tomatoes for this recipe because they are sweeter than a grape tomato. To finish this recipe, add the chicken. When it comes to serving this meal, I have done it many ways. I have chopped my chicken into chunks and mixed it into the creamy sauce. I have also just served chicken strips on top of the pasta. The way you decide to serve this recipe is completely up to you. Top it off with shredded parmesan, bacon pieces, green onions or a sprinkle of Italian seasoning & grab a fork! 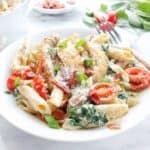 The best creamy Chicken and Bacon Pasta recipe around – made with no heavy cream but packed with spinach and tomatoes. 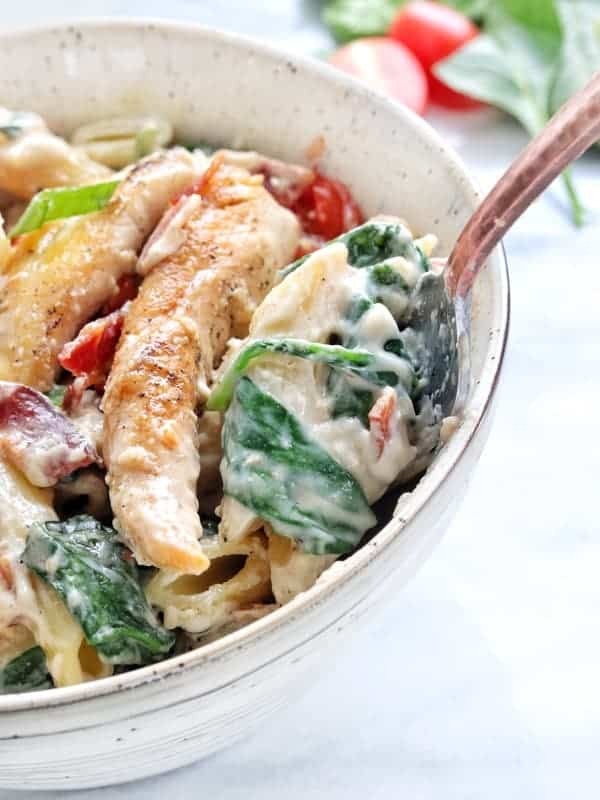 This simple creamy chicken pasta is so delicious, your family will request it time and again. Slowly add milk a little at a time, whisking and bringing the heat back up to a simmer between adding more milk. Continue whisking after the milk is added until the mixture thickens. Add parmesan cheese, green onions, or bacon if desired. Substitute rotisserie chicken or canned chicken for chicken tenders. Start at step 4 if substitute with cooked chicken. Yes, absolutely! Just make sure to squeeze out as much liquid as you can before using it.